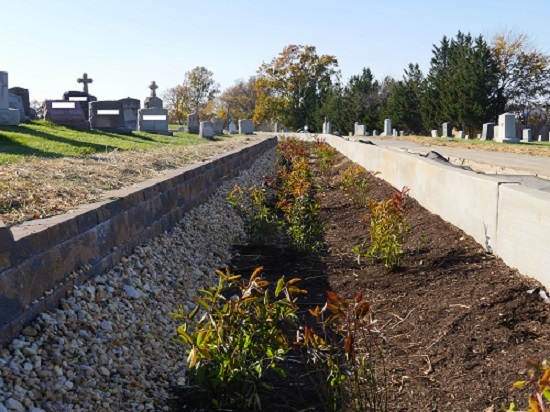 The Washington, DC Department of Energy and the Environment (DOEE)’s Stormwater Retention Credit (SRC) Program takes a unique approach to attracting private capital to effectively leverage public funds. DOEE’s financial commitment to managing its stormwater challenges and proactive transparency in working with investors have created an attractive opportunity for private investment. In late 2017, DOEE rolled out two new elements of its SRC program: the Price Lock Program and Aggregator Startup Grants. These are designed to build private investors’ interest and confidence in DC’s SRC market as DOEE guides the program into a new expansion phase. While this may still be small for many mainstream investors, it presents a distinctive opportunity for those who are similar to Jon Roberts, cofounder of Grenian Capital. Roberts is one of the investors behind Solvitect, an aggregator that plans to generate stormwater credits by integrating green infrastructure into solar energy projects in Washington, DC. “The fact that it’s below the radar of large investment banks and private-equity funds, who look to deploy hundreds of millions of dollars of capital, means there’s more of a need and potentially a higher return for us,” Roberts said. As of May 2018, DOEE had already reserved 10 percent of its funding for early interest in the SRC program. They are confident this strong interest will continue due to their proactive communication to determine investors’ needs and strategies to create transparency in the program. receive compensation for the use of their land. 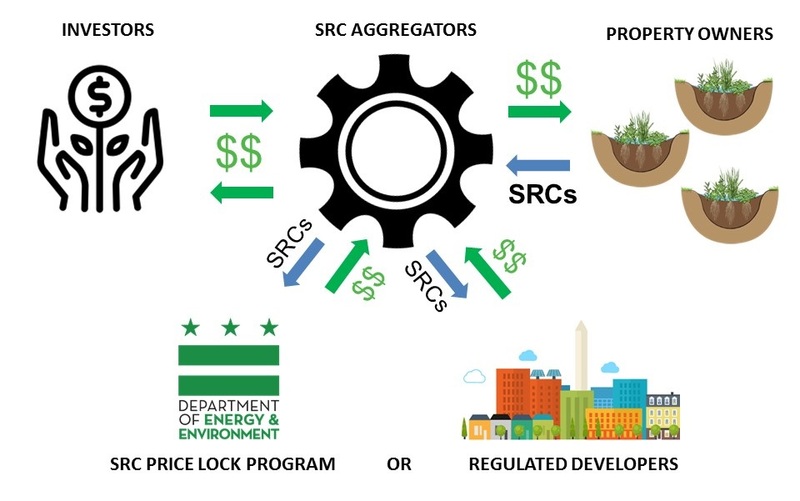 The SRC program incentivizes green infrastructure in DC’s booming real estate market by allowing developers to finance green infrastructure offsite through purchasing stormwater credits. Credits are generated when someone voluntarily installs green infrastructure on a site, without or above a regulatory obligation to do so. Developers purchase these credits in order to meet a portion of their regulatory obligation. “This is an opportunity to shift the location of green infrastructure being installed, and the investments made by private development, to areas that maximize benefits for District waterbodies,” Van Wye said. For example, a developer building a new project in the city center, where opportunities for green infrastructure are limited, could purchase a credit to finance its installation elsewhere. This also enables green infrastructure to be installed in watersheds in DC where it is most effective and needed but where development may not be occurring. Traditionally, DOEE would implement green infrastructure projects through sharing costs with sister agencies and paying private property owners to install green infrastructure. Yet DOEE was often unable to target and take advantage of the most cost-effective opportunities and was limited in its ability to implement projects on private land. Investors, even those seeking to make social and environmental impact, need a strong understanding of risk and market demand. When DOEE launched the SRC program in 2013, a key consideration was how to incorporate a purchase-guarantee program as a strategy to accelerate the credit trading market. This evolved into the Price Lock program. The funds for the Price Lock program are stored to purchase credits from participating investors if they are unable to sell them on the market, providing a guaranteed minimum revenue stream. However, if the SRC market functions effectively, then investors will be able to find more competitive returns on the private market. When setting the prices of credit agreements, DOEE analyzed green infrastructure construction and maintenance costs across DC to approximate opportunity costs and create prices that would incentivize credit buyers. This clearly quantifies and monetizes DC’s stormwater needs by showing offtake guarantee and demand drivers – which are both things investors like. “DC’s stormwater needs are huge,” Roberts said. “They really know they have to do everything they can to attract capital.” For investors, this spells opportunity. Investments based on a regulatory market like the SRC program present unique risks for investors as compared to private markets. In other words, investors want this stability before they make large upfront investments. In the case of the SRC program, investors seek understanding of what price they can expect to receive for their credits and if the credits are even salable before making the significant upfront investment of installing green infrastructure. “The SRC program provides a clear metric backed by a rigorous regulatory framework and methodology to quantify stormwater retention,” Espie said. All credits are certified and trades are tracked by DOEE through the publicly available online Stormwater Database. This system allows for transparency and efficiency – DOEE is often able to certify a credit the same day an application is submitted. Further, when DOEE enters a contract to purchase storm water credits through the SRC Price Lock program, it reserves funding that can only be used for this purpose for 12 years. This provides long-term confidence to investors that the political risk of changing government policies will not impact the value of their investments. There is often an inherent communication challenge between the government and private sector. Government employees may have little experience understanding the needs of investment capital, and investors and government employees can both use language that is “scary” for the other. This strategy seems to be paying off.